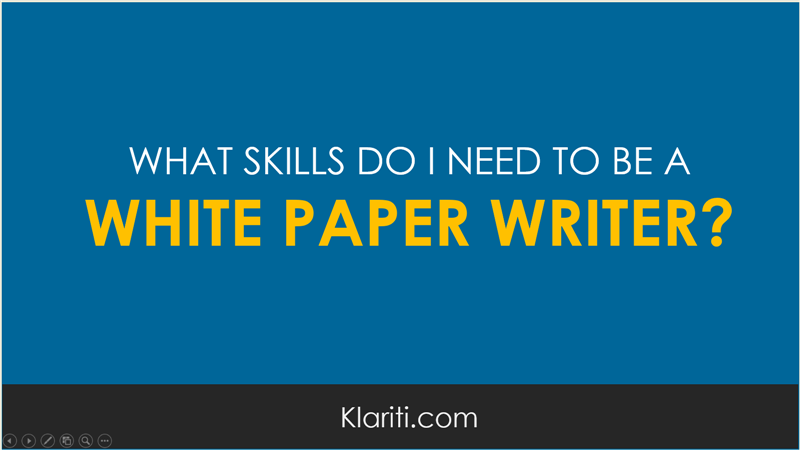 What skills do I need to be a white paper writer? As a freelance write paper writer you can earn more than business writers, technical writers, and science writers. So, how do you get in? I actually spent more time interviewing people than I do writing. When I first started out writing white papers, I thought 90% of my time would be writing, the rest interviews, production, admin, and graphic design. No, most of the time was spent scheduling and running workshops, finding information on networks, clarifying points, Skype calls and so on. So, the ability to do a really good interview is critical to succeeding in this area. The white paper industry is huge. The good news for you is that this means you can specialize in a specific area instead of trying to know everything. For example, if you’ve worked as an accountant or book-keeper, then you can look at specializing in writing financial white papers. See these examples here and here and here. If you left the army, you probably have deep project management skills. These can be applied here or if you have a degree in, for example, biology. You need to be a good writer in that you need to write clear, technically accurate, and factually correct information. Anyone with technical writing skills can usually move into write paper writing quite easily. But you also need a dash of color to add that sparkle to your documents, otherwise they may be too dry. Writing a white paper is a project in itself. For example, you’ll be working with the person who authorized or sponsored the document, subject matter experts for input, and possibly graphic designers if the budget allows this. Saying that, most of the time, I write, design, produce, and publish the document myself. I use a set of white paper templates to structure the content and populate the sections as I go along. What else would you add? Join us on Facebook here. PS – Don’t forget to read these White Paper Writing tutorials. Q: How can I start a career as a white paper writer?